An excellent gift for New England family and friends from the experts at Yankee Magazine. Offers an inspiring and informative mix of classic and lesser-known destinations with gorgeous photographs. A keeper! The experts at New England's iconic Yankee magazine have distilled nearly a century of experience and knowledge into the guide you have been waiting for. 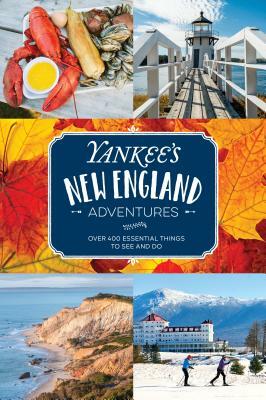 Yankee's New England Adventures is the go-to source for in-depth travel information, with the same stunning photography and practical know-how they bring to you every month. Whether you are interested in exploring the vibrant culture of tiny villages or big cities, eating outstanding meals in colonial inns or vintage diners, rambling through art museums or up steep wooded hills, this is the guide for you. An island stuck in the 19th century? A walk-in, stained-glass globe? A place where you can eat Thanksgiving dinner every day of the year? From the golden dunes of Nantucket to the alpine tundra of the White Mountains, from the blue waters of Lake Champlain to the green grass of Boston Common, travelers and residents alike will find over 400 local secrets, out-of-the-way places, and unique experiences in all six states of this remarkable region of America. Live the Yankee lifestyle and get on the road with Yankee's New England Adventures. About Yankee: Robb Sagendorph founded Yankee Magazine in September 1935 as a New England-centric magazine "for Yankee readers, by Yankee writers, and about Yankeedom." Its "destiny" would be "the expression and... preservation of that great culture into which every Yank was born and by which every real Yank must live." Today Yankee boasts nearly 300,000 subscribers and the company is still family-owned. In addition to Yankee, they also publish the Old Farmer's Almanac and New Hampshire Magazine.